I don’t really care for specific gifts from my son, especially store bought ones, for Mother’s Day. Not to say there is anything wrong with it if that’s your tradition. I like these 8 STEAM inspired Mothers Day Gifts kids can make while exploring, designing, and discovering new things! The gift of learning! 8 STEAM INSPIRED MOTHERS DAY GIFTS TO EXPLORE AND MAKE! Science, technology, engineering, art, and math all come together to make up STEAM. STEAM is really STEM with the addition of Art. Why is STEAM so important? Because STEAM gets the creative juices flowing! Kids are thinking, doing, creating, exploring, observing, and learning! 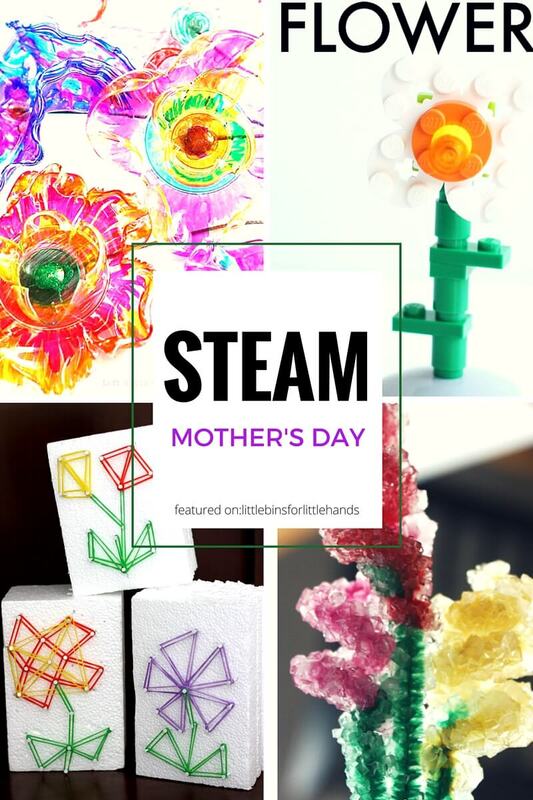 These STEAM inspired Mothers Day gifts kids can make is a great way to combine a DIY gift with a little hands on learning. For those of you who don’t have a craft loving kid, these are a nice alternative that still add color and design! Enjoy the ideas below and click on the purple links to read more. Make a bouquet of crystal flowers like my son did for me last year! Or make a bouquet of colored flowers with a color changing flower science experiment! Have fun with a geo flower STEAM craft on styrofoam. Great way to use trash, encourage math, and make art for mom. Flower Pipe Cleaner Circuitry is a cool tech idea designed by Corinne Takara for Instructables. These recycled plastic bottle flowers from Left Brian Craft Brain look like so much fun to make and easy too! Make a pretty bouquet or a single potted flower gift! Build a flower! I can Teach My Child shows you how to build a simple LEGO flower to give to mom! Plant an indoor bulb garden and observe how bulbs grow with Fun At Home With Kids! You can even make your own seed paper to give as gifts from Share it Science! Of course, these STEAM ideas don’t have to be just for Mother’s Day! 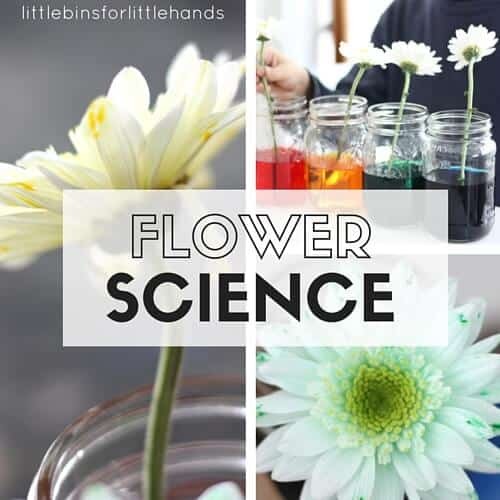 They are also terrific for Spring and flower themed science and STEAM lessons or just for fun. Something for both boys and girls to enjoy creating together for unique gifts or activities. 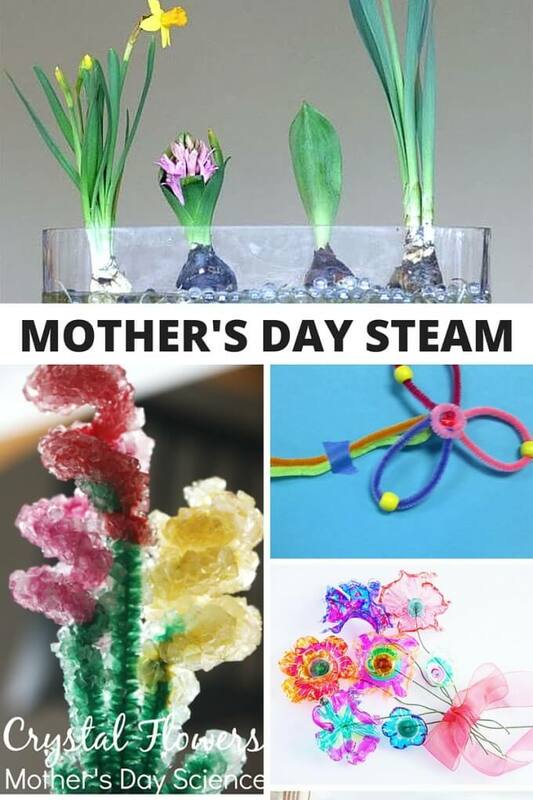 FUN STEAM INSPIRED MOTHERS DAY GIFTS KIDS CAN MAKE! or make a colorful bouquet of real flowers to give!